A new survey suggests most British Columbians also agree with the end of the one-cent coin. Feb. 22, 2017 3:00 p.m. The penny was discontinued as a currency in Canada four years ago, and most people are living life just fine without it, according to a new poll. The survey, released Wednesday, suggests 85 per cent of people in B.C. agree that getting rid of the penny was a good idea — the highest number in the country. Nation-wide, about three quarters of Canadians also don’t miss the one-cent coin, while 20 per cent do. So what about nixing the nickel? 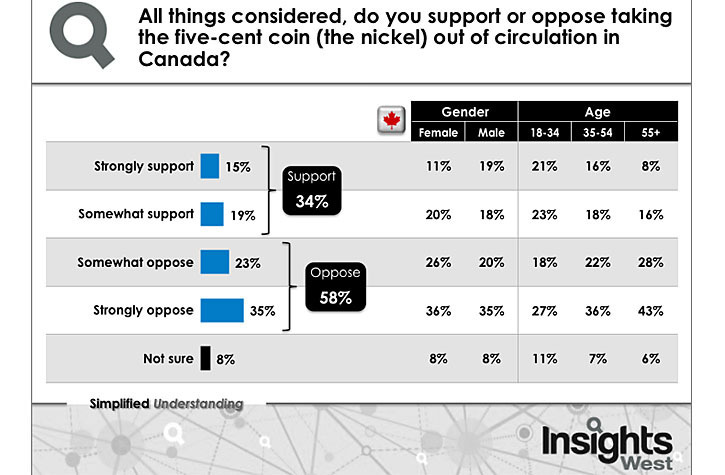 The pollster, Insights West, also asked people how they’d feel if the nickel was taken out of circulation as well, leaving the dime as the smallest valued coin. Few Canadians were in favour of that, especially older people. Those aged 55 years and older were the most adamant, with 71 per cent wanting the nickel to stay. Meanwhile, those aged 18 to 34 were split, with 44 per cent okay with ditching it. “Millennials are more accustomed to paying for small purchases through technology than older Canadians,” says Mario Canseco, Insights West’s vice president of public affairs.